firstly i must make an apology. over the past couple of months i have become massively bogged down with lots of other projects, so have neglected poor old in a town so small. i have had ‘fans’ of the blog (it still perplexes me that i have fans) complain that i haven’t given them any new reading material for a while. for this i am sorry. consider this post the start of 2011 for this here blog. 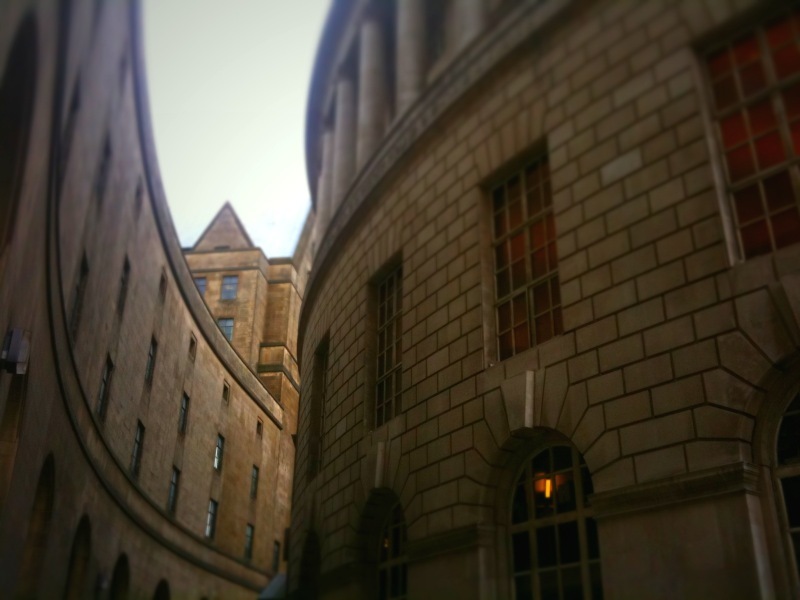 i have previous said on here that ‘library walk, the sweeping curved passage way linking st. peter’s square with mount street, is one of the most beautiful parts of manchester – with the curvature of both buildings drawing you through.’ i still stand by this statement; i do believe that library walk is one of the finest pieces of street planning in the city, and highlights the fine architecture which creates it’s barriers. yet this week the street has closed. as i have previously written about, the central library has closed for extensive renovations, as has much of the town hall with visitor services shifted out to first street. 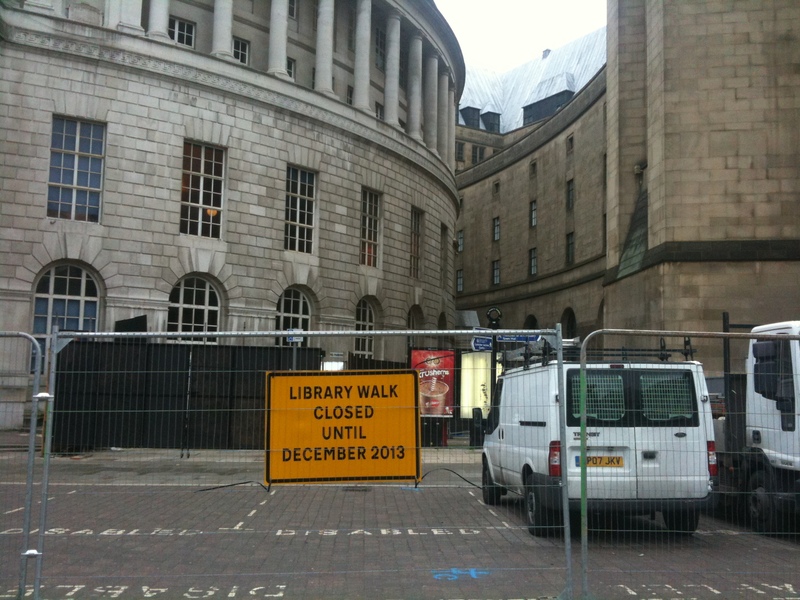 as this work moves into a new phase, library walk has been closed to the public. whilst for some this represents an inconvenience, to me it actually hurts the view of the city. manchester is a city which makes much of its’ appeal as a tourist destination, both to british and international visitors. 2011 in particular promises to be a big year for the tourism draw, with the third incarnation of the manchester international festival, and the promised opening of the national football museum at urbis. 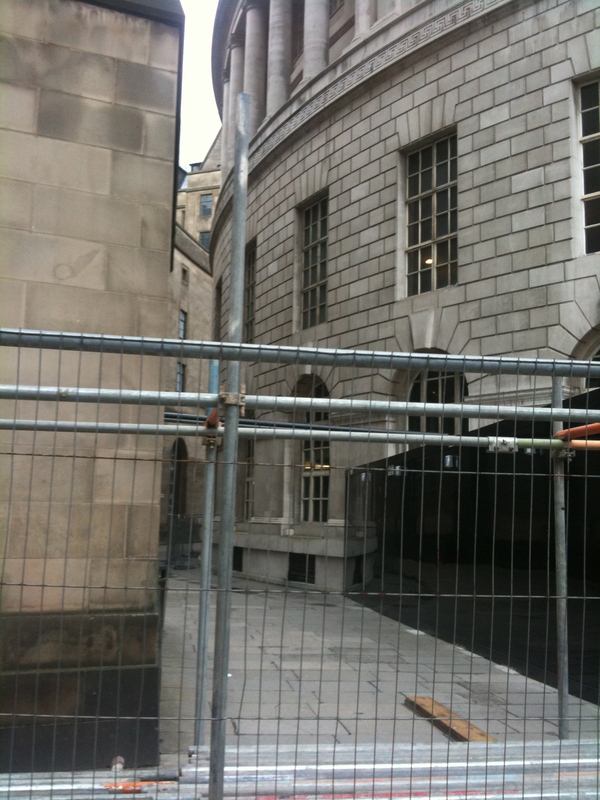 visitors to the international festival in particular, with the festival pavillion in albert square, will pass by an uninspiring wall of fencing and transit vans and walk on by past library walk. now i’m not trying to suggest that this building work shouldn’t be going on. the council will surely have factored in the importance of library walk, an ultimately gone with the decision that for the two building’s beside it to be redeveloped leading to the closure. i just look forward to the day that we have it’s sweeping curves back. This entry was posted in Pictures, thoughts and tagged library walk. Bookmark the permalink. When I first moved to Manchester, I took a walk around that part of the city centre and thought to myself ‘I’m going to like it here’. I also miss being able to go into the library and look at the view of the buildings around St Peter Square. Hope the refurbishment runs on schedule. I too hope it re-opens soon. I like walking down that passage especially when crossing over from Albert Sq to Oxford Rd. My husband’s convinced that walking around the entire far side of the Library is faster, I’m not convinced and don’t care – I love the sweep! 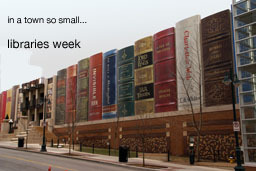 Hiya, did you know about the plans to build in Library Walk? 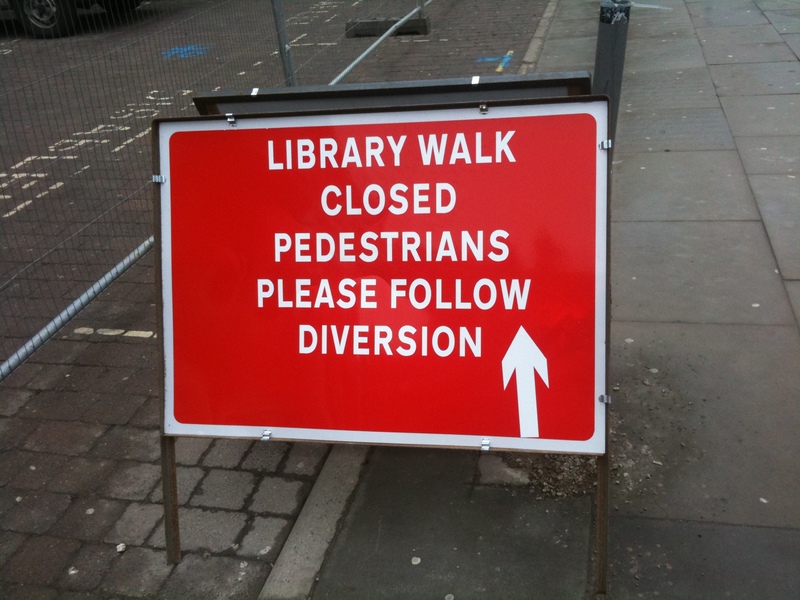 There’s a campaign to oppose the plans: friendsoflibrarywalk.wordpress.com.